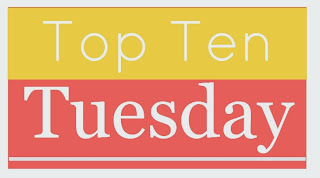 Bingeing On Books: Top Ten Tuesday - Anyone in need of a good cry? Maybe it's just me, but I love books that break my heart and leave me sobbing. Yeah, I'm a sadist that way. 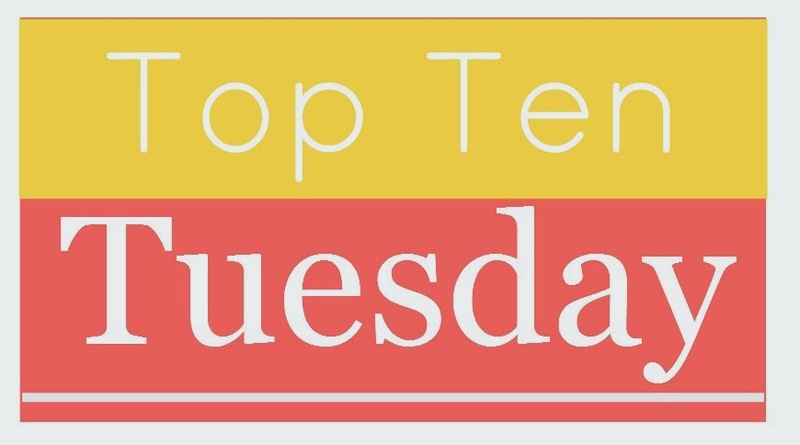 This week's top ten is my favorite heartbreaking books for any of my fellow sadists out there. Of course, I didn't limit myself to ten because I'm a rebel and I refuse to abide by the rules. Have you read any of these? Any recommendations for great books that will make you cry? Sometimes, ya just need a good cry!! I donʻt really cry while reading books (except for HP & the Deathly Hallows), but I definitely have a playlist on youtube specifically for when I need to cry! LaliMama, I actually have never read Harry Potter! Crazy, right? Yes to the Nightingale, I definitely shed a few tears by the end. And Me Before You! Wow, that book just destroys every reader, doesn't it? I just bought I'll Give You the Sun a week ago, so I'm excited to read it. Great list! Jolien, oh you will love I'll Give You The Sun so much. It is such a beautiful book! Yup. I like to cry. Of the ones I read up there - The Nightingale, Law of Moses,Me Before You, I'll Give You the Sun The Art of Racing in the Rain - I cried at all!!! Such great books. Most of the rest are on my TBR. Can't wait to get to them. Great list!! Thanks Grace!! You really need to read the ones on this list that you haven't gotten to yet. They are all so great! jazminjade, you need to read it before the movie for sure!! The trailer makes me cry every single time I watch it, so I am sure it will be great. But the book is always better than the movie. I hope to read I'll Give You the Sun soon. And have a good cry! Deb, oh you really need to read it ASAP! It is such a beautiful book. It is good to have an emotional reaction to a book. I don't read a lot of tearjerkers but Letters from Skye did get me just a little bit... at the end. I guess that means it was good. LOL. Definitely The Art of Racing in the Rain. Wonder if this is still supposed to be a movie? I love little Enzo so much. Thanks for sharing. Barb, I had no idea it was supposed to be a movie until I saw this comment!! I did google it and it is still in development. Apparently, they have Patrick Dempsey to play the lead. So exciting! We have very similar themes this week! :) I also love a book that is going to break my heart and make me cry. I can't believe I left Me Before You off my list. Definitely that one. And The Nightingale and If I Stay... yep. I've yet to read The Law of Moses but it's on my TBR. Tanya, oh man you need to read The Law of Moses. Amy Harmon is such an amazing writer. You will love it! Every once in a while, I love a book that can make me cry! I adored Two Boys Kissing, and Me Before You and Inside the O'Briens as well. My biggest tear-fest lately was Code Name Verity, which just killed me. Great list, and terrific topic! I haven't read any of these aside from The Book Thief, but that's one of my favourite books! Oh yes, The Book Thief is one of my favorite books of all time! I normally avoid books that make me cry but I've become obsessed with Me Before You since seeing the movie trailer. I can't wait to read the book though I've been warned it's seriously ugly cry material. I really want to read The Book Thief and Nightingale as well. Great list! Katherine, oh you NEED to read Me Before You before the movie. The trailer makes me cry every single time and the book is just so much better. Keep the tissues handy! Thanks Marie! YES you do!!! You especially need to read Me Before You before the movie comes out! The Art of Racing in the Rain is one of my favorite books and yes, it made me cry big time in several scenes. The Book Thief did make me cry-I read my daughter's copy-that is her favorite book! Joann, it's one of my favorite books too! I've recently decided I need a "made me laugh" and a "made me cry" shelf on Goodreads. I've actually not read many on your list--Me Before You, All the Bright Places, and The Book Thief are the only ones, and yes they all got me. I always cried during certain portions of Anne of Green Gables and Charlotte's Web. 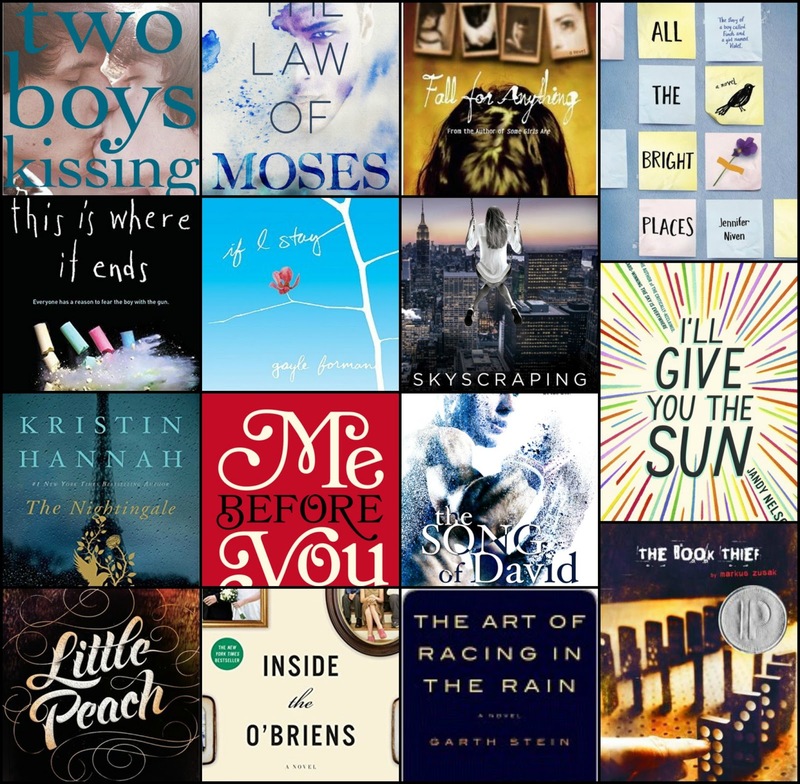 For adult and YA fiction, I know that I was moved to tears (not just mistiness) by The Fault in Our Stars, The Brothers K, Orbiting Jupiter, The Knife of Never Letting Go, and a book I can't remember right now that has the top of a green-haired boy on the cover and a sad surprise at the end. Sprout! That's the name of the book that startled me by making me sad. Wendy, I am so happy that The Knife of Never Letting Go was a tearjerker for you. I just bought that one so now I am even more excited about that! And I should have included The Fault in our stars on this list. It has been a while since I read it, but I cried a lot with that one for sure. And thanks for the recommendation of Sprout. I will check that one out! Thanks Jen! I'll Give You The Sun was so incredibly beautiful. Salt to the Sea is on my TBR for sure. I hope to be buying that one soon. I'm the same way, love books that twist my emotions all up. The Law of Moses was soooo good! Christy LoveOfBooks, oh yes it was. Amy Harmon is such an amazing writer! Oh man, a good cry. I don't need a good cry, I just basically had my emotions gutted by television last night. Unrelated, I also cried like a baby during the first episode of Fuller House, so I am a little concerned that I may not be reliable here. Of these, I have read If I Stay, All the Bright Places, I'll Give You the Sun, and Little Peach... and YES, I cried during all of them. Shannon, I have not seen Fuller House yet, but I fully expect to cry like a baby. I started crying during the trailer for crying out loud, so I know I am in trouble. I’ll admit that I also have a weak spot for heartbreaking books! My favorites are Forbidden by Tabitha Suzuma and Tiger Lily by Jodi Lynn Anderson. I’ve yet to read Me Before You but I’ve heard it’s really good and I’ve added it to my TBR for next month. Soudha, oh you will LOVE Me Before You, but keep the tissues handy! Tiger Lily is on my TBR. I have heard great things about that one. Jandy Nelson and Courtney Summers needs to offer a box of tissues with the purchase of any book from their collection!! Lyn, oh you are so right! Courtney Summers even made me cry with her zombie book. Every single time!